An exciting, and simultaneously challenging, time-lapse project, was for LAMY, the renowned German pen manufacturer. They opened a new flagship store in New York, and this is the time-lapse of the building of the store’s interior over an 8 week period, as the took it from the empty office space, to the sleek modern storefront. Every time-lapse project seems to bring its own unique challenges. With the help of the company overseeing the office revamp, we figured out best camera positions that wouldn’t interfere with the construction workers. I ended up mounting two cameras high on a beam over the front doors of the storefront. With a wide-angle lens, we’d have a great overview of the work happening. Two camera viewpoints would also allow me to change the perspective continually through the final time-lapse video clip. With the contraction project taking place over an 8 week period, I had the cameras on AC power with external intervalometers. This meant that if the power tripped, the cameras wouldn’t reset, but would immediately start taking photos again when power resumed. This was necessary, since the workers had to unplug the power cables a few times to be able to work on the drywall installation. When the cameras were plugged into AC power again, they would just resume. Perfect. The biggest challenge for me was the constant changing of light, as the bright morning sunlight streaked through … alternated with darker, cloudy days. With the help of the appropriate time-lapse post-production software, this was smoothed out considerably. Then the other challenge was dust. I had to protect the cameras from the dust from the carpentry and painting and the finishing of the new drywall. 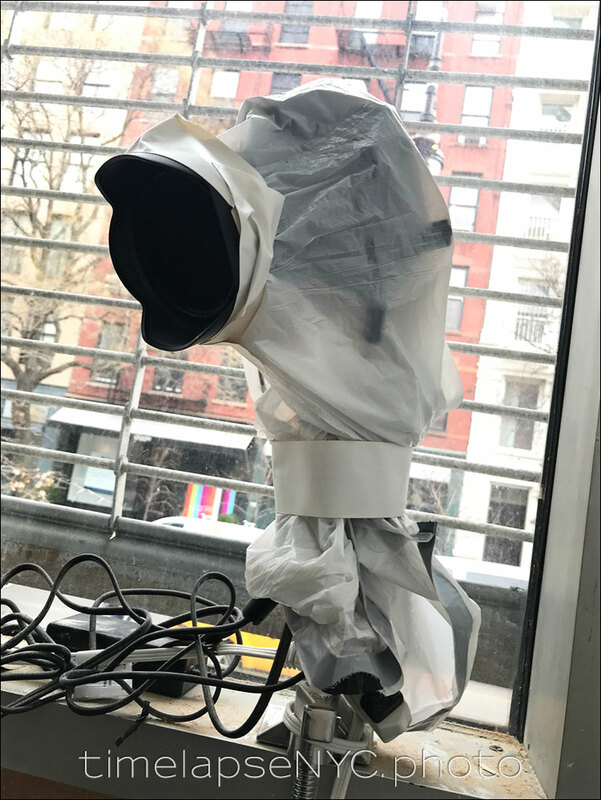 This is one of the cameras, as I mounted them and covered them up in a large plastic trash bag to protect them from the construction dust. 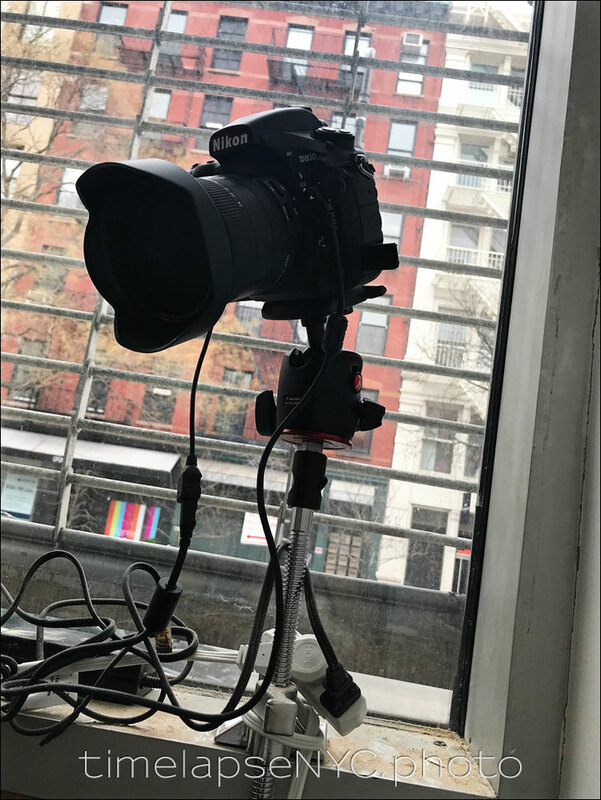 To get the proper view angle set on the camera, I used an external monitor, similarly as shown in this time-lapse project: Emerge212, New York. It finally all came together in a time-lapse video that I am quite proud of. To add context to the final time-lapse, I added video to the intro and the end sections, allowing the viewer to enter the new store … and then show the frenetic activity to complete the new storefront construction.